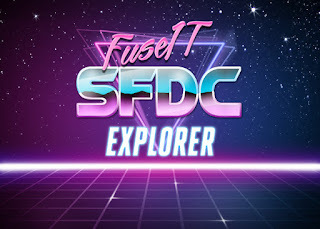 The latest v3.4 release of the FuseIT SFDC Explorer is out and contains a number of new features. Previously if you did a SOQL query with a nested related query I'd flatten out the results for display. This was less than ideal as all the sub records would get mushed together. Yuck! Compare this with the developer console where JSON is the preferred way to handle the nested data. Using the "Flat Display" table button will now toggle between the old behavior and providing a link to popup the nested results. When you first connect to an Org a check will be made for existing IDEWorkspace records for the authenticating user. This can be used to restore the last anonymous apex code or previous SOQL queries. There is now a basic report viewer. The selected report can be exported to CSV, the clipboard, or Excel's XLSX format. I've only really tested it against tabular reports so far. When exported to Excel both the cell value and label will be maintained. It's still early days for this feature. There are lots of improvements I could do around maintaining the field data types on the transition to Excel, such as DateTimes, Booleans, picklists. I could also add an option to nominate an ID column to be used for sorting that would then allow you to access more than 2000 records. Do let me know if this is an area that would be useful to extend. I'd noticed that the login time was getting successively slower. Turns out it was getting expensive to describe the sObject metadata as the number of sObjects grew in each org. They have to batched per 100. I've switched to loading the metadata asynchronously on initial login. It might take a moment before all the sObjects are available. After a Session is established a quick check will be made for the current pod status and patch version. Improved Tooling API Metadata exploring by caching the describesObject results. Selecting Id's or the Session ID from the Status Bar will give an option to copy the value to the clipboard. Improvements for manual package creation with Metadata Deployment. You can now remove previously added nodes, or diff them with the target org. Option to filter an Apex log to just rows that match the search term.